On the evening of May 1st 2011, Barak Obama’s statement was one of triumph and celebration. He claimed that, with the death of Osama Bin Laden, “justice was served”. The media spin following the announcement was equally as celebratory: “It is a great day for America and the world”…”The biggest piece of news since 9/11″…”We’ll all remember exactly where we were when we’ve heard this piece of news”…The entire “event” was artificially inflated, exaggerated and glorified. Should the death of a man cause such happiness and celebrations? Since when have we devolved into such a barbaric state? Because he perpetrated 9/11? Did he also cause the WTC 7 to implode? Damn you Osama and your team of engineers! So why should we care if Ben Laden is dead or not? Is he really dead? Did he die nine years ago? Who really knows? We’re living in an era of artificial, fully staged, media-generated events. So why was Bin Laden’s death announced on the evening of May 1st? Because it was the required sacrifice of the “most magical time of the year”. May 1st, or May Day, was considered by several cultures to be important holiday – especially in occult circles due to celestial alignments. In Illuminati lore, it is regarded as the second most important day of the year. In fact, the Order of the Bavarian Illuminati was founded on May 1st 1776. The origins of the Beltane festival can be traced back to the celebration of the Sumerian God Enlil – who is known to us as Baal. The name Beltane (pronounced “B’yal-t’n”) is said to originate from the word Baal. Celebrations of the Beltane festival are very similar to ancient rituals celebrating Baal. Ancient beliefs and rituals are an intricate part of today’s Illuminati’s occult practices. As their symbolism and modus-operandi is slowly infused into society, their previously secret rituals are conducted on a mass scale. The general population becomes a clueless participant of their occult festivities, not knowing it is actually adding to its potency. They believe that the only way to attain enlightenment and realize the 'truth' is to realize that the distinction between the Self and the Universe is a false dichotomy and that the distinction between mind and body, between the ultimate serpent (Adisesa) and the individual soul (Jiva) is the result of an unenlightened (ignorant) perspective. According to them, when these two forces are balanced (married), the 7th/crown chakra (sahasrara / cosmic consciousness) is activated and man becomes an enlightened being. They also believe that in order for these two forces to be balanced, the enmity (i.separation,dichotomy) between the two opposite forces has to be abolished. -"Symbolism is the language of the Mysteries; in fact it is the language not only of mysticism and philosophy but of all Nature, for every law and power active in universal procedure is manifested to the limited sense perceptions of man through the medium of symbol. Every form existing in the diversified sphere of being is symbolic of the divine activity by which it is produced....In a single figure a symbol may both reveal and conceal, for to the wise the subject of the symbol is obvious, while to the ignorant the figure remains inscrutable...."-Manly Hall . Bin Laden is a symbol of global hatred and disdain (enmity) because majority of people have been manipulated to believe that He carried out the 911 attacks. The Prince and the Princess (who are generally loved and celebrated by many people) are symbols of the two forces in nature that need to be balanced / reconciled in order to attain enlightenment. When the mystical marriage occurs, the enmity between the opposing forces is destroyed, (i.e.The old thought form: Order of division / enmity between the two opposite forces is dissolved and dissipated) both forces are reconciled and ‘enlightenment’ is attained. From what we have read above, we would be justified to conclude that the union/marriage of the Princess/Queen with the Prince/King symbolizes the new thought form or order of unity with the 'higher self' while the symbol of enmity represents the old thought form of disunity with the 'higher self'. Alchemists often represent the feminine principle as a white queen and the masculine principle as a red king during the process of carrying out their so called 'great work'. They believe that it is the marriage between the opposite forces i.e the white queen and the red king that produces perfection and enlightenment. And it is therefore not a coincidence that the royal couple channeled their beliefs during their wedding ceremony. The Illuminati are simply trying to tell us that their long held ambition of uniting Mankind with the so called 'ultimate consciousness' that lives in every human being (through social engineering) is currently at an advanced stage. (That is why they engineered his death to coincide with the so called Arab awakening (to a new dawn or consciousness) in the Middle East. The destruction of the dichotomy that exists between both of man's conflicting natures and the reconciliation of man's 'lower' nature with the 'higher consciousness' is what occultists refer to as the Great Work (Magnus Opus) and that is why May 1st is generally set aside by many countries to celebrate workers (It is called Labor day in some countries and Workers day in others): It is ultimate goal of every occultic worker to complete the great work of balancing his/her two conflicting natures in order to achieve enlightenment. In the US, May 1st is set aside to celebrate Law day (remember Obama claimed that justice was served when announcing Osama's death ) This celebration was put in place to reflect on the role of law in the foundation of the country and to recognize its importance for society. All occultists believe that justice can only be served when the universal law of opposites: As above, so below is attained (i.e no peace without justice) . 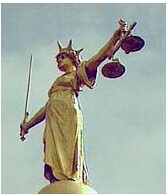 And that is why the Universal symbol of justice consists of a woman holding a sword and a pair of scales. The sword represents the slaying (destruction) of man's base nature (individuality). The woman represents the bride (occult worker) who works to slay her base (barbaric, jungle, wild) nature and get married (make peace with) to the 'perfected nature' (consciousness) that lies dormant in her. Her 'death' represents the final sacrifice that she has to carry out in exchange for a new dawn (Married consciousness). The scales represent the balance (marriage, reconciliation) of opposites. N.B. Some symbols representing the Woman depict her as a blind person i.e as a lady blindfolded by a cloth. This symbolizes the fact that the occult initiate who wishes to complete the Mystical marriage (Great work ) must be ready to lose his natural (barbaric) way of viewing things (mind state) in order to connect with the source. i.e. 'Natural' (ignorant) humans do not see the need to reconnect with the source because they are self satisfied in their individualized state. The Animal sacrifices that are carried out during the rituals of Beltane symbolize the sacrifice (destruction) of man's animal or barbaric nature in order to connect (get married) to the ultimate consciousness (satan, lucifer, zeus, baal) and attain what occultists call the perfected (christ) nature. The fertility that is hoped for after the sacrifice symbolizes the ability of the occult worker to manifest the so called luciferian light (new consciousness, new life, new nature) when his lower nature is destroyed. Footnote  The River Styx represents Mankind's unconsciousness (The things in Man that he is not conscious of): When the ignorant/individualized soul (symbolized by Osama) reigns in the heart, mankind is conscious of the self and ignorant/unconscious of the spirit. When the awakened/enlightened/married soul (symbolized by the Prince and Princess) reign, mankind is conscious of the spirit and ignorant/unconscious of the self so the burial of Osama in the sea symbolizes the fact that Mankind was no longer conscious of its ignorance, hatred, and separation from the spirit (and each other) and the Banishment to Hades suffered by the detested souls symbolizes the total annihilation of all of mankind's divisive tendencies in order to assure enlightenment/perfection.